Land registry documents about the Ham and surrounding areas are very important when looking at possible redevelopment. There is confusion about who owns what, and what can be done with it, in the Port Royal area. This confusion is not only on the part of the general public but also sometimes on the part of the Councils. For example, on a page on the East Devon District Council website about what land is owned by them they claim the whole of the Esplanade right round to Alma Bridge, but not the land on which the toilets are built. Land registry documents (DN 322835, 1992) tell a slightly different story. 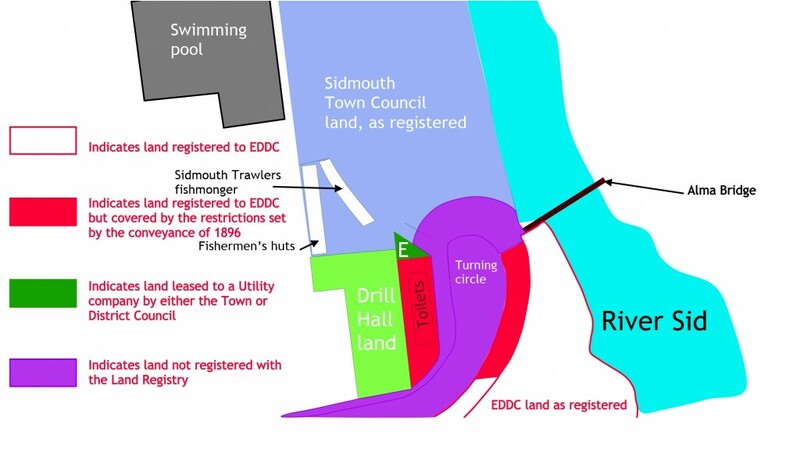 According to them the EDDC owns land both sides of the turning circle but it is held subject to the terms of the conveyance of the Ham from Mr Radford to Sidmouth Urban District Council in 1896. So they are not free to do with it as they would wish. They can not close it to the public nor erect any permanent structure on it taller than 7 ft in height. 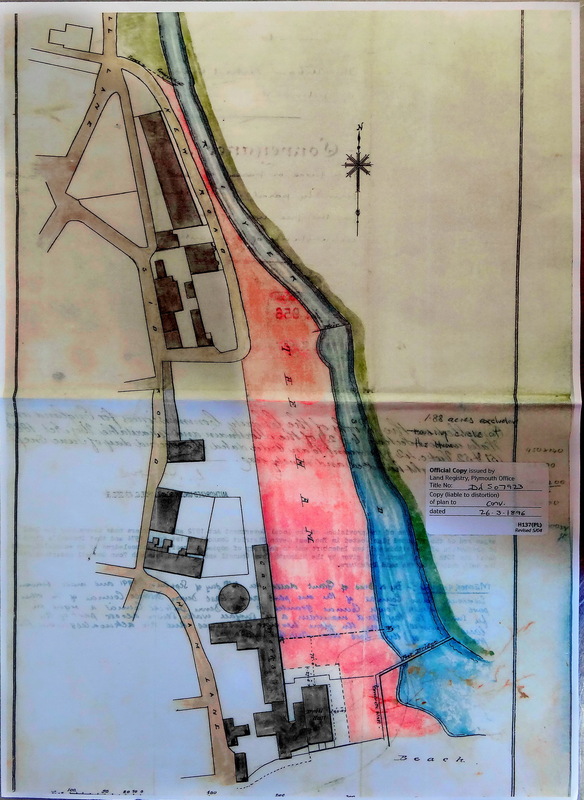 They also have registered the land between the Esplanade wall and the Sid, on the conveyance from Radford to Sidmouth UDC part this land is shown as the Ham. Of course it is all complicated by the work to limit the extent of the Sid and by the fact that the bridge shown in 1896 was replaced in 1900 and may be in a slightly different position. It is of interest how land forming part of the Ham was disposed of by the Town to the District when it was part of a gift made to the Town; and indeed how it was legal to build the shelter and toilet block when it exceeds 7 ft in height. I presume that one of the tasks for the Scoping Exercise now being started by both Town and District will be to sort out anomalies like these. The following drawing has been made from an amalgamation of several Land Registry documents and shows registered land ownership in that small area of town. I have not included land under the (leased) ownership of the Sailing Club, Lifeboat Station, Swimming Pool and car parks although you can find the Land Registry documents with the rest, below. 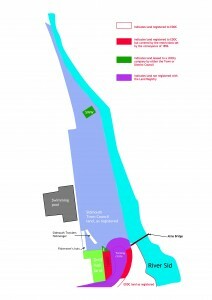 EDDC own the land for all these areas and also the Drill Hall land. A detail from the above drawing. The Land Registry documents do not list previous owners so the history of the Ham has to be discovered by other means. A copy of the conveyance from JGG Radford to Sidmouth Urban District Council in 1896 is also held by the Land Registry. This confirms that the minimum southern boundary of the Ham runs in a straight line eastward from the front of the Drill Hall land. The uncertainty about the actual southern boundary is due to the fact that the line between the land and the foreshore was subject to change in different weather conditions. The beach itself has been in various ownership over the years. The Ham, certified Land Registry document. The conveyance specifically passes to the UDC any rights Mr Radford may have held in the area between the marked land and the sea. These are the documents I used to construct the images above, if they are not showing then please refresh the page to encourage them to appear!